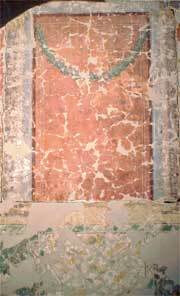 Roman frescos and wall paintings can be lifted and conserved. The studio offers a lifting service for recently found archaeological wall paintings, and a remounting service for display in museums and on site. Archaeological wall paintings in museums which have been poorly conserved in the past can be retreated and mounted afresh. Training courses are offered in the techniques used to paint frescos from both the Roman period and later. 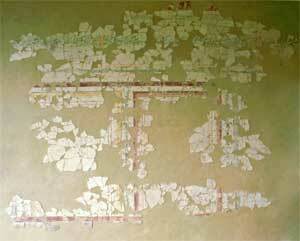 This double sided wall painting from the Norfolk Street Villa, Leicester was lifted and conserved by Theo Sturge. The upper photograph shows the whole of one side. This was the uppermost layer of plaster and had scattered when the wall fell and there was extensive loss. The lower photograph shows a detail of the second side. This side was trapped in position as the wall fell and was much more nearly complete. The paintings were executed in high quality fresco.